Two Sided Mattresses Better For Your Back and Budget - Harbor Springs Mattress Co.
Do you remember when mattresses were two-sided? Two sided mattresses used to be common and they helped balance the wear and weight over time with a periodic turning of the mattress. Today, two-side mattresses are almost unheard of. The obvious downside of a one sided mattress is quicker wear. Quicker wear leads to uncomfortable sleep, a sore back and the need to replace your mattress sooner. This is one area where handcrafted mattresses often stand apart. 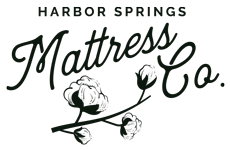 Harbor Springs Mattress Co. is one of the few mattress makers left in the United States still building two-sided mattresses. Hand-tufted for ultimate comfort and support. The importance of a two sided mattress is that you can rotate the mattress and extend its life and comfort. This is vital because it gives you proper support for a longer period of time so your back has proper alignment. Imagine slipping into luxurious comfortable sleep that was tailor made just for you.